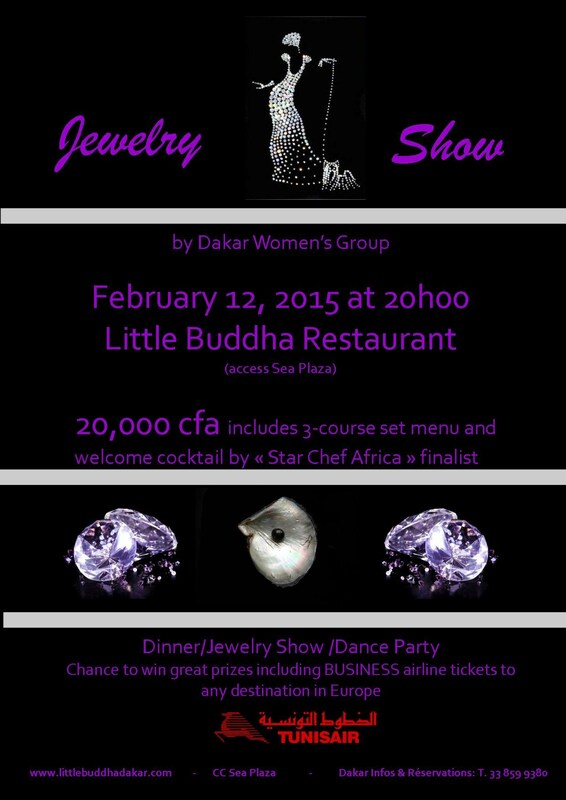 Just in time for Valentine's Day, Dakar Women's Group is holding a Jewelry Show at Little Buddha Restaurant (Sea Plaza, near the Radisson), Thursday, February 12, 8 p.m.
Tickets are 20,000 cfa for a three-course dinner, a signature drink, DJ and dancing, and a display of some of Dakar's most creative and interesting work in jewelry. Five designers and jewelers will be featured -- My African Heart (Wendy Spivey), Florence de la Pechardiere, Miss Wude', Ann Quist, and MiDiamond. We will also have a tombola including jewelry from our featured designers and two business class tickets from TunisAir, open destination. Call Little Buddha at 33 859 93 80 to reserve, or you can buy tickets at ISD Wednesday afternoon, after school.